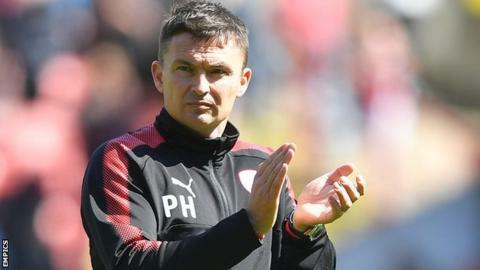 Barnsley head coach Paul Heckingbottom has signed a new rolling contract. The 40-year-old has been in charge at Oakwell since February 2016 following Lee Johnson's departure. He guided the Tykes to promotion to the Championship and victory in the Johnstone's Paint Trophy while serving as caretaker before being appointed as the club's head coach in June 2016. "This is recognition of Paul's hard work," chief executive Gauthier Ganaye told the club website. Heckingbottom said: "It's something that if we're honest was done a while ago in terms of being agreed, but getting involved in the transfer window followed by the sad news about Patrick Cryne put it on the back burner. "It's nice for everyone now to understand why we were relaxed, there was never any doubt."